All over the world God is speaking to His Church and calling her to rise up, take her rightful place and be all that He has called her to be. This book, a timely and prophetic call to action, seeks to stir believers to find their place in God's plan and engage with His purposes. It will help to equip and empower an end-time army for the battles which lie ahead. Steve Uppal asserts that many in the Body of Christ are functioning well below their potential because they are 'wounded warriors' who were once engaged in advancing God's kingdom, but who have now backed off. Help is given to those who want to return to active service and see God's purposes advanced in our nation. 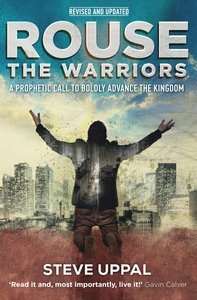 About "Rouse the Warriors: A Prophetic Call to Advance the Kingdom"
All over the world God is speaking to His Church and calling her to rise up, take her rightful place and be all that He has called her to be. This book, a timely and prophetic call to action, seeks to stir believers to find their place in God's plan and engage with His purposes. It will help to equip and empower an end-time army for the battles which lie ahead. Steve Uppal asserts that many in the Body of Christ are functioning well below their potential because they are `wounded warriors' who were once engaged in advancing God's kingdom, but who have now backed off. Help is given to those who want to return to active service and see God's purposes advanced in our nation.Previously published as Rousing the Warriors. Steve Uppal is the Senior Minister of All Nations Christian Centre in Wolverhampton. All Nations is a vibrant multicultural church build on the three pillars of training and developing disciples, engaging with the community through social action, and overseas mission. Steve is married to Esther and they have four children.